There are evenings, especially right around bedtime, when I think that my kids are truly acting like animals. Sister is hiding under the bed and brother is bouncing on top, both making noises you might find on a jungle expedition. Don’t even get me started on meal times, when one of my children (who shall remain nameless) has recently started eating like a “puppy dog”, face-down in the plate. Over In The Jungle proves that I’m not the only mama who has animal babies. This storybook app is vibrant and lovely, with original “illustrations” – painstakingly created from polymer clay – and gently rolling rhymes. 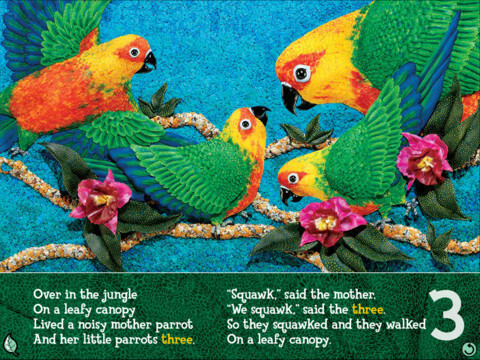 Different pairs of jungle mothers and their offspring teach young players about counting, animal life, and harmonious ecosystems. The interactivity of this app is quite amazing. Besides the two reading modes (Read to Me, Read to Myself) there is also a song version of the story. 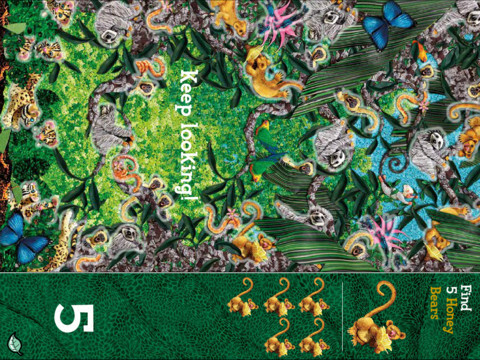 Players can move and tilt the iPad to watch the animals wiggle, and tapping the screen activates a realistic animal sound. Fun facts and real photos of each animals give kiddos another visual to help reinforce the information they’re learning. Last, but certainly not least, there’s a hide-and-seek style counting game that helps develop number recognition from digits 1 to 10. My little animals, who are 3 and 5 (in human years) loved this app. The oldest is pretty keen on all things animal, and my youngest has a distinct fondness for babies of all shapes and forms. They listened intently to the story and played the song version several times. The three of us together had a lot of fun trying to find all of the hidden animal babies. It’s quite easy to see why this app and the book it was based on has won several awards. Not only is it visually stunning, but the educational content is far-reaching and comprehensive. The $3.99 price tag is pretty minimal; you would pay much more for the book and only get 10% of the content in the app. 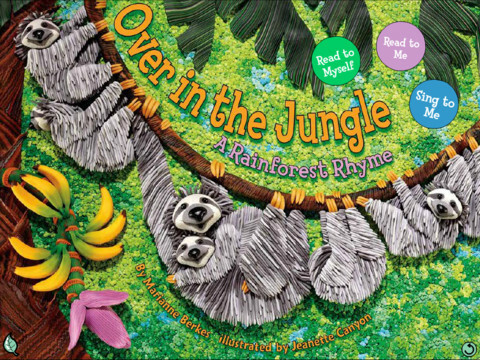 We think Over In The Jungle is an All Star, and we’re pretty sure you (and your little animals) will too.